PIRIOU has recently delivered the 53 m FSIV KACEY to SUISSE OUTREMER AG. The KACEY is built by PIRIOU in Vietnam on a PIRIOU’s design, this 9th unit of the FSIV 53w model This is the first of a series of three units ordered by SUISSE OUTREMER AG which will be commercially operated by ABC MARITIME AG. This first collaboration with ABC MARITIME AG reinforces PIRIOU’s positioning as a major player on the Fast Crew Boat segment for which PIRIOU will deliver another 6 units of this model in 2014. 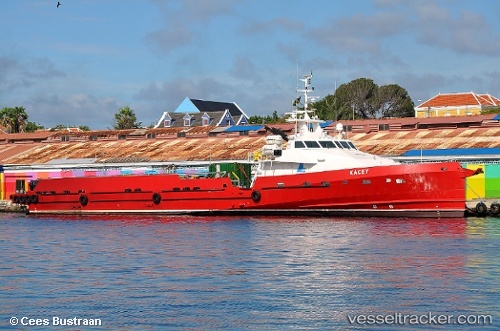 The FSIV 53w is a highly versatile aluminium vessel able to perform multiple missions for the offshore industry, particularly personnel transportation and cargo on deck. With a sea proven design developed by PIRIOU INGENIERIE recognizable by her straight bow improving the performance and personnel comfort, this FSIV 53w offers a range of advantages: - improved light and loaded ship speed with constant consumption, - significant improvement of economic regime consumption, - maximum comfort with a lounge fitted with 48 seats (« Business Class » option) and two owners’ cabins. « KACEY » also offers a large autonomy (135 m of fuel oil) and an important 226 t cargo deck. Thanks to her waterjet propulsion and her class 2 dynamic positioning system (DP2), she has exceptional maneuverability.